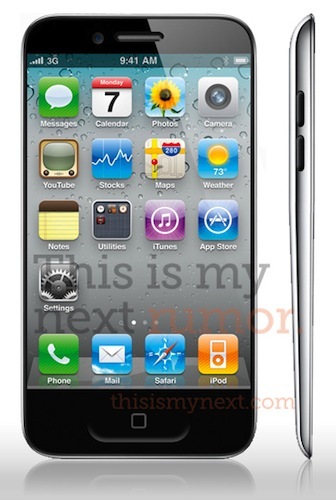 iPhone 5 To Feature 3.7-inch Screen, Larger Home Button, Thinner Design? A new report posted by Joshua Topolsky at This Is My Next seems to contradict the rumors we've been hearing in the past weeks in describing the next-generation iPhone -- so far dubbed iPhone 5 -- as a complete redesign of the existing iPhone 4 hardware. The report comes with a mockup based on sketches and descriptions the website received by multiple sources over the past weeks, and shows a dramatically thinner device with a "thick to thin" design from top to bottom similar to MacBook Air's main body, and a larger multitouch display set at approximately 3.7 inches. The change in size would allow Apple to keep the existing Retina Display branding with a drop to 312ppi (iPhone 4 features 326ppi, and Apple claims a "Retina Display" can be called so starting at 300ppi on an iPhone), and it's something that's been rumored before and even spotted in allegedly leaked Apple design documents. Furthermore, we’re hearing that the screen on the device will occupy the entire (or near to it) front of the phone, meaning almost no bezel. Our source says the company is doing very “interesting things” with bonded glass technology, and has been exploring designs where the earpiece and sensors are somehow behind the screen itself, making for a device where the display is actually edge-to-edge. The versions of devices our sources are seeing could be design prototypes and not production-ready phones. Still, there are strong indications that Apple will surprise a public that’s expecting a bump more along the lines of the 3G to 3GS — and this is some insight into where those designs might be headed.